Spike Lee’s critically acclaimed Do the Right Thing is celebrating its 25th anniversary this summer. The film explored issues of race and violence on one hot day in Brooklyn, N.Y. Since then, there’s been a resurgence of all things late ’80s and early ’90s, and it’s not just the fashion. All these years later, we’re still grappling with many of the same issues and seeing many of the same patterns that were at the center of the classic movie’s plot. 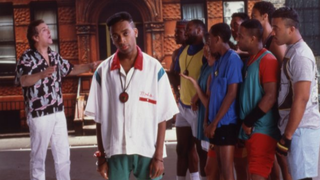 The Brooklyn of Do the Right Thing, is not the Brooklyn of today. Lee came under fire for his recent remarks on gentrification in the New York City borough, but few would argue that his comments weren’t based on real concerns. Bodegas have turned into specialty coffee shops and longtime residents are being priced out as largely white, better educated and wealthy newcomers flock to the area. In 2012, Brooklyn was listed as one of the fastest gentrifying neighborhoods in the country. Spike tried to tell us, but we didn’t hear him though. Clifton stepping on Buggin’ Out’s shoes was cause for a fight in Do the Right Thing. Collecting expensive sneakers, such as Jordans, was an emerging subculture in the late 1980s. Today, there are large sneaker conventions where attendees sometimes make sales in the thousands by trading rare, limited editions of popular brands. Coverage of this young man, who opened a sneaker resale shop in Harlem, provided a deeper and less stereotype-plagued picture of kids who treasure shoes. Who knew a small plot point in the movie would predict a passion that would still be driving profits decades later? In the film, the neighborhood is regularly patrolled by prejudiced cops who harass young black men. In the 25 years since its release, police harassment and brutality have continued and inspired national outrage. Measures like stop and frisk only made it easier for young people of color in New York to be targeted by law enforcement. Sadly, on Do the Right Thing’s anniversary, police still, far too often, don’t. In the film, Radio Raheem got a hard time from Sal for blasting music from his boom box. Today, you’re more likely to hear Drake than Public Enemy, but young black men are still targets of hostility, especially when they claim too much space or make too much noise. In 2012, Jordan Davis was shot and killed by Michael Dunn during an argument over loud music Jordan and his friends played from their car. Dunn was only convicted of the attempted murder of the other teens in Jordan’s car, instead of first-degree murder in the killing of Jordan. Many took it to mean that the lives of young black men are just as undervalued as ever. A recent MTV report found that millennials, while more socially liberal than past generations, are hostile to affirmative action. The study shows that they are more likely to see color blindness as an appropriate way to deal with issues of race. Others have indicated that white Americans believe that they are experiencing more racism than black Americans. Attitudes like these make it increasingly hard to improve racial issues in America. It's no surprise that many, if not all, of the tensions in Do the Right Thing remain unresolved. Diamond Sharp is an editorial fellow at The Root. Follow her on Twitter.